Like other reptilian creatures, Guar can be bred for bright, even gaudy colors. The Argonians of Dhalmora offer this entertaining variant, a popular performer in Tamriel's traveling shows. 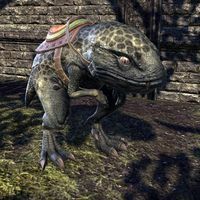 The Bal Foyen Circus Guar was available in the Crown Store from May 31 to June 4, 2018. A breed of guar bred for cavalry use, able to carry an armored warrior into battle. 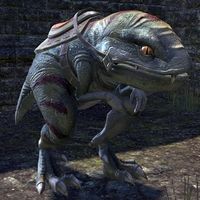 The Banded Guar Charger is a grey and red guar mount available from the Crown Store for 013001,300 , and in the Wild Hunt Crown Crates as an Epic-level reward. Its default name is "Redeye". 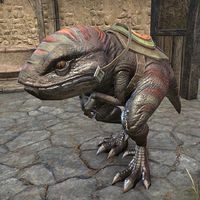 Guar vamidiums, or Dwarven Guar Mounts, are most often associated with Dwemer sites in Morrowind—as might be expected, since that's where guar are most in use as pack and riding animals. 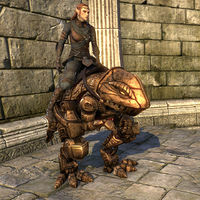 The Dwarven Guar is a Dwarven Automaton-themed mount, or "vamidium". It is available from the Crown Store via Dwarven Crown Crates as an Apex-level reward. Its default name is "Thuanchuth". 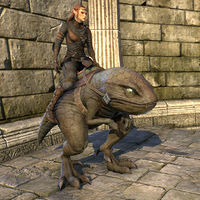 The Dragonscale Barded Guar is available from the Crown Store in the Dragonscale Crown Crates as an Apex-level reward. Its default name is "Guargoth". Flame Atronachs are summoned from the Oblivion plane of Infernace, a realm so hot that molten rock flows across its surface, and its Daedra are creatures of living flame. Summoned to Tamriel, such atronachs can be given almost any shape, even a Guar! This Flame Atronach-themed guar is available as an Apex-level reward in Flame Atronach crates. It is the only mount to not have a default name. Since the Guar is native to warmer climates, the existence of the Frostbane Guar in Skyrim, theoretically protected from the cold by its dangling talismans, may be the strongest argument of those who say the Frostbane wards actually work. The Frostbane Guar was available from the Crown Store in the Scalecaller Crown Crates as an Apex-level reward. Its default name is "Snowscale". 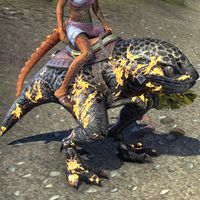 The Glowgill Guar was given away as a Daily Reward in December 2018. Its default name is "Swimmer". A crossbreed of banded and wild guar, as fearsome as it is intelligent and difficult to control. The Golden Eye Guar is a green and red guar mount available from the Crown Store for 013001,300 , and in the Storm Atronach Crown Crates as an Epic-level reward. Its default name is "Shreddie". The robust Green Narsis is the standard mount and dray-beast of central Morrowind. The Green Narsis Guar is a green guar mount that came with the 2015 "Black Fredas Special!" bundle in the Crown Store, and can also be found in Dwarven Crown Crates as an Epic-level reward. Its default name is "Narsty". 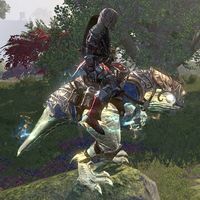 Guar-Lizard Steed is a mount available from the Crown Store via Xanmeer Crown Crates as an Apex-level reward. Its default name is "Jaunty". In Black Marsh this mount is called Scales-Seem-Daubed-with-Hist-Sap, but the rest of Tamriel just calls it the Hist Guar. It is the only subspecies of guar known to enjoy music. The Hist Guar is a green guar mount with glowing yellow splotches. It is available from the Crown Store for 015001,500 , or as part of the Shadows of the Hist Collector's Bundle. Its default name is "Apricot". The legend of Jaque o' the Hollow has spread even to the misty realms of eastern Tamriel where the Guar roam the woods and marshes, and during the dark nights of the Witches Festival reptile-riders may also find themselves haunted and headless! 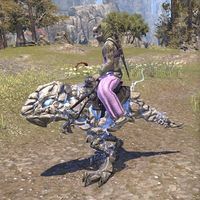 Hollowjack Rider Guar is a mount available from the Crown Store via Hollowjack Crown Crates as Apex-level reward. Its default name is "Scaryscales". During the Jester's Festival even the lowliest of commoners can pretend to be a mounted knight with a whimsical Novelty Stick steed. Guars are popular in the Aldmeri Dominion. The Novelty Stick Guar is just a fake stuffed guar head on a stick. It is available for 00900900 during the 2019 Jester's Festival. Its default name is "Guar Sticklord". This stalwart mount comes from the ashlands downwind of the volcanoes of the Velothi Mountains, and is well adapted to surviving under the harshest of conditions. 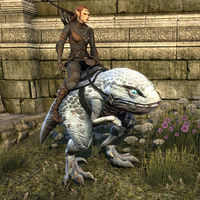 The Pale Velothi Guar is a white guar mount previously available from the Crown Store for 025002,500 , and can also be found in Dwarven Crown Crates as a Legendary-level reward. Its default name is "Ash". Psijic monks crossing the doubtful terrain of Black Marsh or southern Morrowind are more concerned with the practical matter of safe and sure riding than whether they look dignified and impressive. For these purposes, the Guar Exemplar is unequaled. The Psijic Guar Exemplar is a yellow ghostly guar available in the Psijic Vault Crown Crates as an Apex-level reward. Its default name is "Swampfoot". Blending in with the shifting gray ash clouds on the slopes of Red Mountain, the Shadowghost Guar are the only known nocturnal breed of the species, and thus are rarely seen, even by the native Dark Elves. 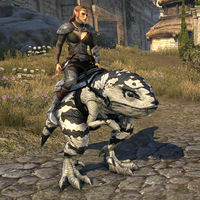 The Shadowghost Guar is a black and white guar mount that was available from the Crown Store for 020002,000 for a limited time, from October 12 to October 16, 2017. Its default name is "Pumice". The naked, grisly smile on the broad skull of the Skeletal Guar may be enough to send lesser opponents fleeing in terror when you ride into battle on its creaking, bony frame. The Worm Cult, of course, will just be jealous. The Skeletal Guar is available in the Reaper's Harvest Crown Crates as an Apex-level reward. Its default name is "Grinly". This colorful guar was once thought to be poisonous by many, but found to be relatively harmless by an adventuresome rider. Caution! Patience is needed to bring this obstinate mount to heed. 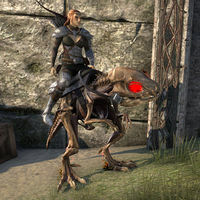 The Skyfire Guar Mount was available in the Crown Store for a limited time, priced at 025002500 . Its default name is "Gemscale". By modifying Koron's Peremptory Summons, the standard spell used to call atronachs from Oblivion, the conjurer can compel a Daedra to assume the form of a common Tamrielic mount - even a Guar, if so desired! 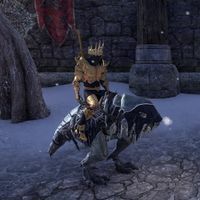 The Storm Atronach Guar is a storm atronach in the shape of a Guar mount, available as an Apex-level reward in the Storm Atronach Crown Crate. A bolt of lightning strikes it when it roars and it glows for a few seconds afterward. Its default name is "Bouldergrin". A sturdy, multi-purpose guar, at home anywhere from swamps to the ashlands. 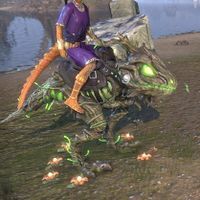 The Tessellated Guar is a green guar mount available from the Crown Store for 013001,300 . Its default name is "Patches". Wild Hunt Guar are mounts that have reverted to the shapeshifting chaos of the Dawn Era. They have become part plant and part animal, as wonderful as they are abominable. The Wild Hunt Guar is a green Wild Hunt-themed guar mount made out of roots and held together by nature magic. It is available from the Crown Store via Wild Hunt Crown Crates and is considered to be an 'Apex' level reward. It leaves behind green footprints, and small flowers briefly bloom where it stands still. Its default name is "Root-Foot". This page was last modified on 2 April 2019, at 01:03.